Experience matters. 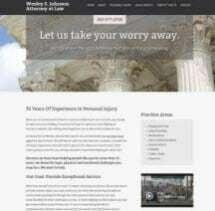 At the law firm of Wesley Johnson, Attorney at Law, you will find a dedicated legal team with more than 30 years of personal injury experience. We focus on protecting the rights of injury victims throughout the Kelso, Washington, area. Additionally, we offer legal guidance on other areas of law such as employment law, estate planning and probate, misdemeanor defense and traffic violations. The legal system exists to promote justice. After a tragic accident, you deserve to have your voice heard. We will work hard to ensure that you get a fair shake. Our lawyer and staff provide high-caliber legal representation in a friendly, client-focused environment. We always strive to respond promptly to client concerns and to return phone calls within 24 hours. You can count on us to keep you informed throughout the process. Because we generally take personal injury cases on a contingency fee basis, there is no risk for you to discuss your case with us. We won't get paid unless you do. Call 360-562-0074 today for a free initial consultation. Wesley Johnson practices in the areas of employment, estate planning, misdemeanor defense, personal injury, probate, and traffic tickets. My goal is to take the stress of the claims process away from my client so she or he can focus on recovering from her or his injuries. I help you to find all of the insurance coverage that might be available. I have defended hundreds of traffic tickets over the last few years and have had a great deal of success. I only defend tickets in Cowlitz County. I have been defending misdemeanors since 1979. Although I have in the past defended serious felonies, I realize that misdemeanors like DUIs, Driving While Suspended or Reckless Driving are the most serious crimes most of us will ever face. Do you feel like you have been treated unfairly at work? I represent employees who haven’t been paid, aren’t getting overtime pay or minimum wages or have been discriminated against at work.